When I was a child we went to many camp sites and seaside resorts but when I was 13 years old we discovered Haven Weymouth Bay. As soon as we got there we loved it. Weymouth is such a lovely seaside town and it isn't too far from Bath (or Midsomer Norton where my family live now). We went to Haven Weymouth Bay for quite a few years. In fact one year we went four times in one season. When I got to about 18 years old we stopped going. Twenty years later we took my niece Lilly for her first visit and she loved it just as much as we did as kids. It was three years ago that I last visited Haven so we thought we would go back this Easter. So last Saturday we made our way to Weymouth. It was just us girls (Me, Mum, my sister Anna and my 9 year old niece, Lilly-Ana) which was lovely because we all have our separate lives now. It was nice to come together and spend some quality time together. We arrived at Haven Weymouth Bay all excited as we usually do and we were not disappointed, in fact we think it's been one of the best holidays we have ever had. 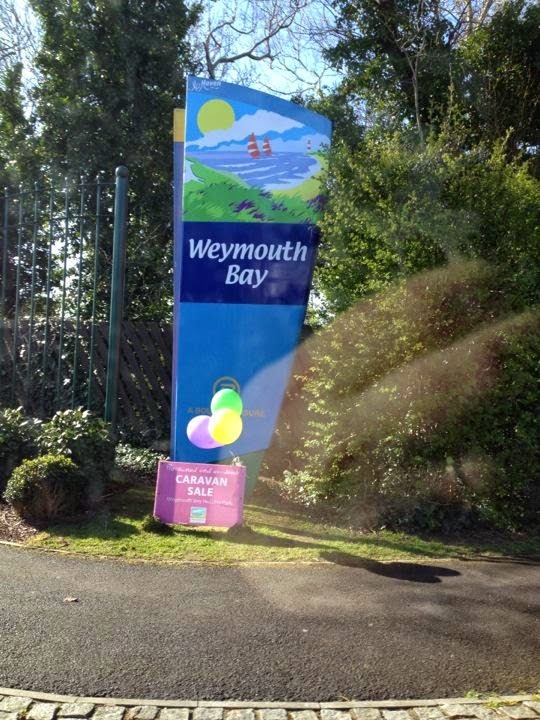 What we love about Haven Weymouth Bay is that it isn't a huge site. You can use the facilities at the Haven Seaview park up the road but we never do. There is one club house (though they do have a few events in the cafe bar too), a shop for bits and bobs and merchandise, an indoor and outdoor swimming pool and rapids (the lazy river), an arcade (which Lilly absolutely loved) and the beach of Bowleaze Cove is just a short walk away. Weymouth is a couple of miles down the road. You can walk along the beach from Bowleaze Cove or catch the bus or drive in easily. The only thing that wasn't great is that the internet didn't work on Vodafone on my phone which was as annoying. Anyone who knows me will know I am a bit of a social media addict so not being able to get online in the caravan was a little frustrating, especially as every other network worked fine. I could only connect to the internet at the cafe on site using their wifi or at the beach. We got into our caravan about 2pm which we privately rented and was lovely. It was in a great position too with only a short walk to the main facilities and to the path towards Bowleaze cove. We spend the first afternoon settling in and getting ready for the evening entertainment. There is always something going on at Haven for kids in the daytime with activities such as swimming, football, archery etc. We didn't really do any of the daytime activities because the weather was so lovely we wanted to go to the beach or for a nice walk. Lilly did however have a go at AquaJets in the lazy river rapids in the pool. AquaJets are machines you hold on to that pulls you along. Lilly absolutely loved it and would love to have a go again. When we went to Haven three years ago we met a lovely lady called Heather and her two children Lillie and Evie. They were down again this time with Heather's wife Shell. We sat with them every evening in the club and Lilly went for a sleep over with Lillie (two Lilly's - it get's a bit confusing at times). It was great to meet up again and we laughed so much. The evening's entertainment starts early at 5pm with bingo. 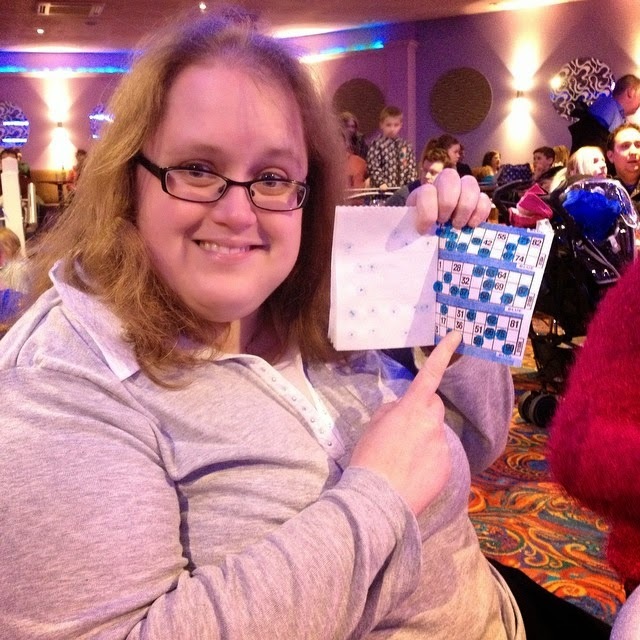 We love bingo and went every evening to play. Starting at 5pm is a bit of an awkward time because we had lunch at around midday/1pm and come 4pm we didn't feel hungry enough to eat. Fear not though, for there is a Papa John's pizza shop at the back of the club so we had pizza and chicken for a few of the nights. There is also a shop at the back of the club that sell's merchandise and popcorn. We did get through a lot of popcorn. Love it! As I said we love bingo. My mum and sister plays bingo locally every week. I was so chuffed that I won £100 for a line on my second night which was amazing. The prizes were really good ie. £300 for a full house. The next night I won £50 for a line so I won a total of £150 which was awesome. Mum won a few nights ago too. She won £205 for a full house. Poor Anna didn't win anything but there is always next time. We always make sure we are there for bingo. Next up is the Seaside Squad show which is with the Haven characters. There is Rory the Tiger, Bradley the bear, Greedy the gorilla, Anxious the elephant, DJ Ned and Polly. Lilly is a bit old for them now but I can totally see how the younger children love them all. The show usually has four of the characters on stage and then afterwards the children can have their pictures taken with the characters. We did manage to persuade Lilly to go up and have a picture with the squad one night. Whilst we are all a bit too old for the Seaside Squad we still bought some of the merchandise from the shops. I bought a Bradley bear pen (I love pens), Anna bought a Rory teddy for her car and a DJ Ned pen and Lilly bought a DJ Ned teddy. 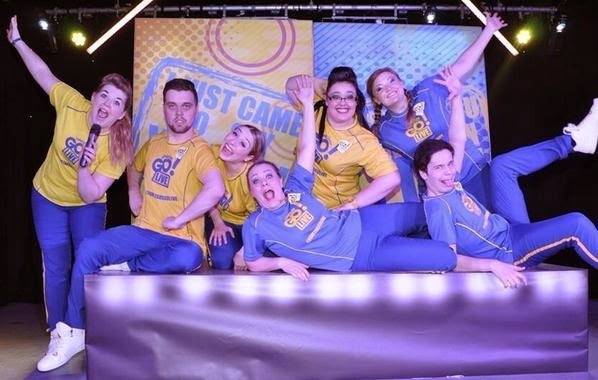 The FunStars are the team of talented people who do all the entertainment during the daytime and evening. At Haven Weymouth Bay the team this year were lovely and brilliant. As always we had a few favourites. First up is Jonathan who is such a brilliant show man. We loved him as soon as we saw him singing on stage. He called us his Chiccas (not sure of the spelling) and even had us up on stage. More about that later in this post. Then our favourite girls: EmilyJ the fab presenter, so lovely, friendly and bubbly and Holly who was lovely too. And then there was my favourite FunStar - little Kieran. I call him little because when I sit here and think about it I am almost old enough to be his mother (scary thought - I really am getting old - I will be 36 next week). Where do I start with Kieran? the moment I saw him my first thought was just WOW. If anyone knows me well you would know that looking wise he was so "my type". I couldn't stop looking at him because he is one of the most handsome men I have ever seen. He is just so gorgeous. I think seeing him kind of made me feel young again. When I was a teenager and used to go to Haven I had a favourite Haven Mate (my generations version of a FunStar) called Simon. I thought he was amazing and even wrote him a letter saying I thought he was lush when I got home *cringe*. I looked at Kieran and I saw the teenage girls swooning over him and they reminded me of me when I was their age. It took me back to those years. During those teenage years I wanted to be a Haven Mate so much and idolised the other Haven Mates (especially Simon). Due to various illnesses including depression I never did become a Haven Mate. I think it was great to see Kieran, a young guy, really enjoying his job and achieving what I never did. He has amazing energy and is absolutely brilliant with the kids. For some reason I felt really shy to talk to Kieran and I didn't want to disturb him whilst he was working plus I didn't want to look like an idiot but on the last night I had a chance to chat to him for a little while and he is such a sweet heart, just a lovely chap. I really think he is a great FunStar and is going to go a long way in life. Each evening the FunStars have a time where they do their live show which features competitions and challenges for the kids and a few party dances including their signature song and dance which I still have going around my head now. We enjoyed watching these and on the first night Lilly went up on stage with Heather, Lillie and Evie to do a challenge to go around and collect as many items as possible beginning with certain letters. When it came to the letter M - I handed up my mobile phone and the FunStars EmilyJ and Kieran took a selfie with it. My sister Anna somehow managed to find a malteaser in her bag which had been in there for well over a month and poor Kieran was told to eat it. Ewww! Our team won and so Lilly got a certificate, sticker and car sticker. As part of FunStars Go Live you are put into teams - either yellow or blue - if your age is an odd number like Lilly, who is 9 years old, then you are on the yellow team and if your age is an even number than you are on the blue team. Both have little chants they sing to the opposite team when they win. 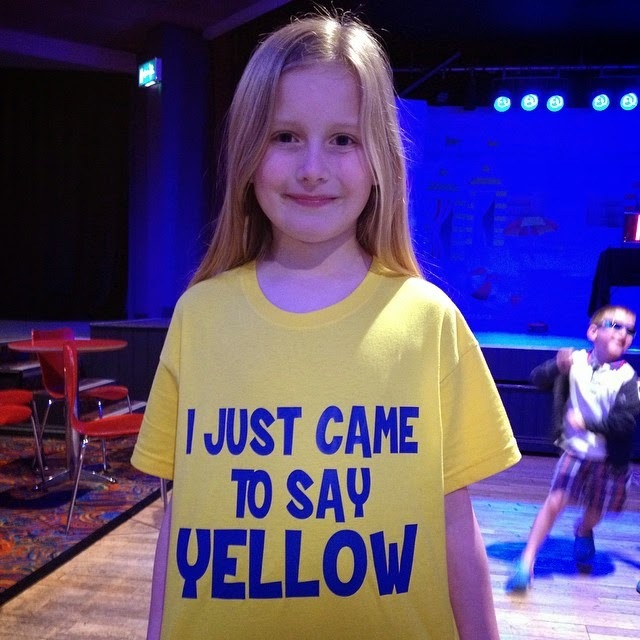 Lilly loved it so much she even had a t-shirt printed with the slogan "I just came to say yellow" on. It's all so much fun. At the end of the show the FunStars do their signature dance which is just fab too. We love a good party dance. Speaking of party dances they do them throughout the week. It's funny because half of the retro party dances they do are not that retro to me. We didn't get to hear Wig Wam Bam all week which was a firm favourite of ours twenty years ago. Never mind there was other good ones including YMCA and Aga Doo. Go win is the adults chance to win a prize by playing fun games on stage. 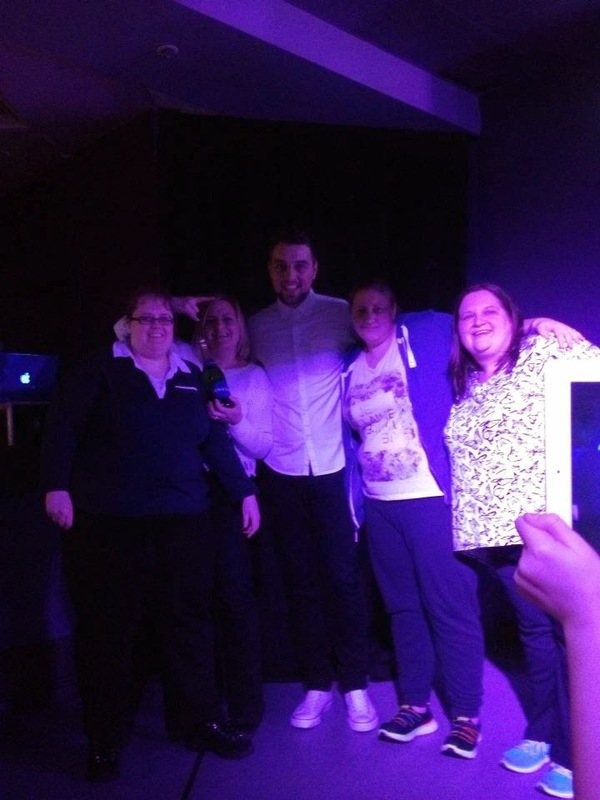 Heather and Shell managed to win two bottles of champagne over the week by going on stage and playing the fun quizzes. We really enjoyed cheering them on and the prizes. Most evenings there were live acts on stage, including singers and comedians. There was also shows starring some of the FunStars which were brilliant. On Monday night FunStar Jonathan did a show singing songs we knew and love. Anna, Heather, Shell and I really joined in, singing and swaying and Jonathan called us his Chiccas. He invited us on stage to be Girls Aloud. I really didn't want to go on stage but when we got up there we had such a fun time. We basically danced like in the retro party dances...side step, side step, clap and turn. When he put the microphone in front of Anna to sing but she wouldn't, nor would Shell, I didn't because whilst I knew the song "Love Machine" I wasn't 100% sure on the words but Heather, well she owned it. She grabbed the microphone and really went for it. Jonathan gave us a bottle of champagne for taking part. The other shows by the FunStars was Girls On Film which was songs from the movies and Destination 90s which was music from the 90s which was our era so we really sang along and enjoyed it. They also did a show called MusiKids with children staying at the park who auditioned to be in the show. The songs was from shows such as Matilda, Oliver and Frozen. It was lovely to watch. We usually left the club between 10pm and 11pm because the kids started getting tired and had run out of money in the arcade which they loved and won lots of little prizes. We returned to our caravans and slept ready for the next day. I will be doing another post about our time in Weymouth and Bowleaze Cove shortly. If you are looking for a family holiday I would highly recommend Haven Weymouth Bay to anyone looking to have fun. I went to Haven with stomach pains and stressed out...I came home smiling, relaxed and happy. 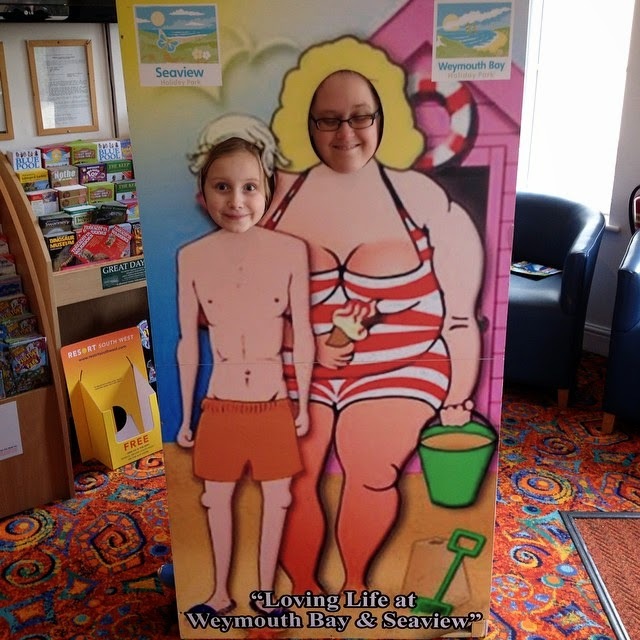 Thank you so much to everyone at Haven Weymouth Bay for making our holiday so enjoyable, we already miss you! We will be back next year for sure. "I would rather go to Haven Weymouth Bay than to Disneyland!" - that says it all really! Disclosure: I was in no way paid or compensated for this post. All views are my own. Ahh you are lucky to live in Weymouth. Love it there. Have a lovely holiday. Haven Holidays are fab!